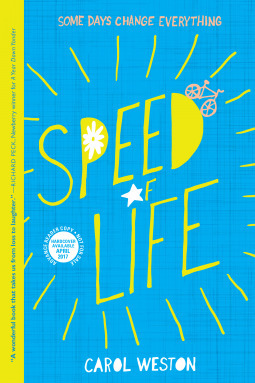 Speed of Life is a coming-of-age heartwarming, bittersweet story of a young teen who learns to deal with her mother's death and all the changes that come with it. Although this is late middle-grade/YA fiction, I was carried away by Sofia and her story. This book made me burst into laughter and it made me burst into tears. I felt so many emotions as I read through it: compassion, joy, sadness, and hope. As a mother with teens, this story really resonated with me. The story is told through Sofia's first-person POV and this is what makes the story so delightful, heartbreaking and funny. She is a great heroine as she navigates grief, high school, boys, first love and the challenges of family. I just love MG and YA books that involve parents and family life, and that do so realistically. The author, who has been the "Dear Carol" advice columnist at Girls' Life since 1994, cleverly uses her work experience to draw a fun plot that revolves around spilling one's secrets anonymously. Sofia decides to write to Dear Kate about her feelings on everything she is going through, only to discover Dear Kate turns out to be her dad's new girlfriend. "...everything can change in an instant--for worse, sure, but also for better. Sometimes, if you just keep climbing, you get an amazing view. You see what's behind you and what's ahead of you and--the big surprise--what's inside you." These gems coupled with her thoughts on growing up made this a wonderful read. The story is also set in New York City, which I enjoyed. Speed of Life will resonate with young teens, especially those going through the loss of a parent or close friend. It will also resonate with adults who have teen kids. I loved reading this story and will add this one to my Best Reads of 2017 list. Carol Weston has been the "Dear Carol" advice columnist at Girls' Life since 1994. 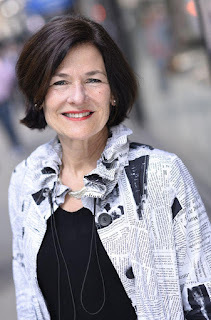 Her sixteen books include Ava and Pip, Ava and Taco Cat, Ava XOX, The Diary of Melanie Martin, and Girltalk: All the Stuff Your Sister Never Told You. She lives in Manhattan. Visit her at www.carolweston.com.